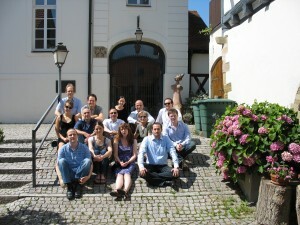 The second Leo Baeck Fellows workshop was held in the Freudental, a village near Stuttgart, on 10-14 July 2011. The core of the workshop was naturally the papers given each fellow, presenting the progress they had made on their research project (or the challenges they encountered) since the first workshop in Brighton. I found the discussions following the papers interesting and constructive. We were also pleased to hear Prof. Atina Grossmann’s lecture “She’rith Hapleta: Survivors as Invented Community”, in which she shared with us the fruits of her latest project. The setting of the workshop within the restored local synagogue (“Ancient Synagogue of Freudental Center of Culture and Education”) was most inspiring and provided an informal learning experience of the history of a destroyed rural German Jewish community, and of its memory today. Also the excursions we took gave us a taste of Germany today, which is dealing with the heavy burden of Nazism on the one hand (Zentrale Stelle der Landesjustizverwaltungen zur Aufklärung nationalsozialistischer Verbrechen Ludwigsburg), and is cultivating its achievments in culture and the arts on the other (Deutsches Literaturarchiv Marbach and Literaturmuseum der Moderne Marbach). To make our experience whole the workshop had an artistic side to it as well: a musical opening in which melodies of the Jews of Germany were sung; and the screening of Quentin Tarantino’s Inglorious Bastards. The movie was followed by a discussion led by Dr. Daniel Wildmann, bringing the participants of various backgrounds to talk about one the most painful areas in our existence.